Bellevue Commons is a mixed-use center with over 20,000 square feet of building area containing retail space and four apartments. 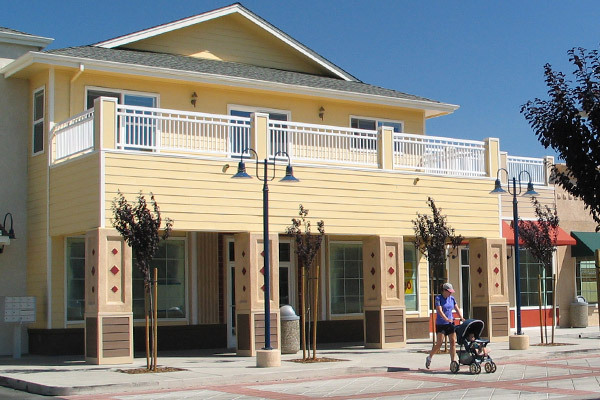 Located in southwest Santa Rosa, it meets Santa Rosa’s goal of providing retail uses within an easily walkable proximity to residential neighborhoods. The center fronts onto a major roadway and adjoins a newly developed neighborhood. The City of Santa Rosa presented TFA with a Neighborhood Enrichment Merit Award for the project in 2003. The project features two buildings turned inward into the site. The building forms are residential in scale and combine plaster, horizontal and vertical siding. Columns with decorative tile insets, second floor balconies with open railings and brightly colored awnings create a visual vitality and further reduce the buildings to a pedestrian friendly scale.